Invited keynote speaker: Gabor Remetey-Fülöpp, Secretary General of HUNAGI "What brings the near future?" We hope to see you in Victoria, Canada in September! HUNAGI was just invited to the Kick-Off meeting for eSDI-Net+ which was now fixed by the Project Officer for September 20/21 2007 in Darmstadt. Visitors from 49 countries read this blog so far in this month. 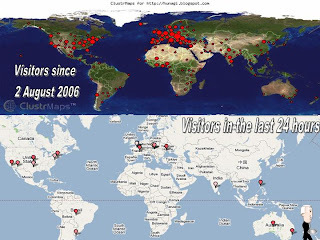 The overall geographic distribution of the visitors is illustrated on the upper part of the image while in the bottom part the geographical location of the visitors during the last 24 hours can be seen. By clicking, the image will be magnified. 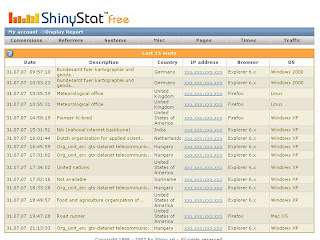 Also the Hungarian version (http://hunagi8.blogspot.com/ ) is popular, but please pay attention also on the http://www.unsdi.hu/ website providing information related to the United Nations and the SDI/GI/GI issues. j. Earth & Life - the origins of diversity. What are obstacles of applicability of the Prometheus method? Maryana V. Bereznyuk Odessa Board of Ukrposhta (UA), Kamal K.
HUNAGI was approached by a British company today related to a conference to be held in Brussels in the subject GIS as tool against the crime between 25-26 September 2007. 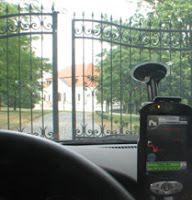 Referring to our earlier blog HUNAGI has the intention to address the most relevant institution in order to ensure the adequate representation of Hungary on this conference by decision makers and GIS specialists working in crime management from prevention to case investigations. The official letter will be sent by the President of HUNAGI Mr. Zsolt Barkóczi. Later today an information set will be available for raising general awareness among the interested institutions. Feedbacks are expected till next Tuesday as latest. Please write to hunagi@hunagi.hu or gabor.remetey@gmail.com . Ms. Aliëtte Miedema, Editorial Manager of the GIM International was asked by the SG of HUNAGI, Member of the Advisory Board of GIM International to publish a paper on the new Hungarian portal and service application called MÉTA related to the Nature and Landscape Protection. The project was orchestrated by Mr. Ferenc Horváth of the Institute of Ecology and Bottany of the Hungarian Academy of Sciences at Vácrátót. 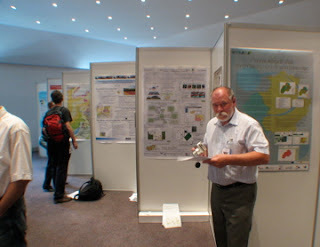 The development was partly supported by the GSDI Association Small Grant Programme and by GISCorps in 2005 onward and it is intended to propose by HUNAGI for the Europewide case applications portfolio of EUROGI and suggested to take part in the competition of the JaenBlaeu@Prize in 2007. A projektvezető írja: "Az MTA ÖBKI (HUNAGI) 2005-ben Small Grants-et nyert a GSDI nemzetközi pályázatán (http://www.gsdi.org/Association%20Information/Committees/SponsoredProjectsCmmtt.asp ), azzal a célkitűzéssel, hogy a MÉTA-program (Magyarország Élőhely-térképi Adatbázisa - http://meta.novenyzet.hu/index.shtml) digitális térképi eredményeinek internetes publikálására felméri és teszteli a térinformatika által kínált megoldásokat. Munkánkat a GSDI támogatásával és a GISCorps szakértői segítségével kiegészítve megvizsgáltunk több alternatívát a statikus térképi publikálástól a dinamikus on-line térképszolgáltatásig - és első munkatérképeink alapján - létrehoztunk egy kísérleti honlapot, ahol országos táji-botanikai eredményeinket mutatjuk be ("MÉTA a világhálón" - https://msw.botanika.hu/meta/2_meta_a_vilaghalon_KV_terkepek.htm). A projekt összefoglaló jelentését hamarosan közzé tesszük. Bizonyossá vált, hogy eltérő céljainknak megfelelően többféle technológia alkalmazása a célravezető. Továbbfejlődésünkhöz a GSDI és a GISCorps támogatása hathatós segítséget jelentett. 2) longer term action to pave the way for strengthening the collaboration using the VISEGRAD institutional and financial potentials and tools to reach the professional goals of the individual organisations in the fraework of the European development (e.g. implementation of the INSPIRE legislation framework). 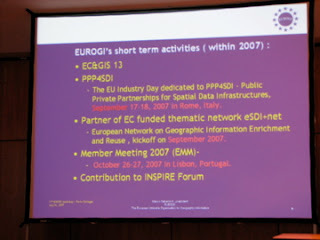 The date October 26-27, 2007 was announced at the 13th EC GI-GIS Workshop by Prof. Mauro Salvemini, President of the European Umbrella Organisation of Geographic Information. 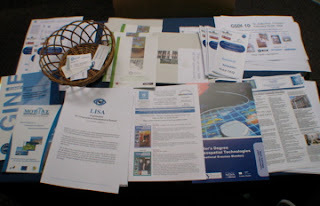 The planned date of the Workshop was 17-18 September 2007. The event has been postponed due to schedule conflict with an e-Gov Award event held in Portugal under the auspice of the PT Semester of the EU. 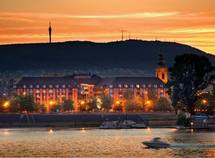 Nominee for the Hungarian industry representative recommended by HUNAGI was submitted to EUROGI on 15th July 2007. The nominee DigiTerra is member of HUNAGI since many years. The DigiTerra Ltd is an innovative solution provider in operational application of GI/GIS in agriculture, forestry having impact on the economic-societal development of the people living in rural areas. 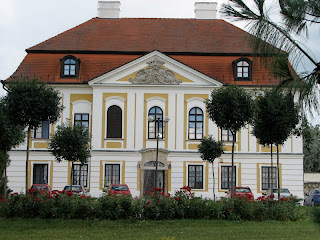 This baroque style Szent-Miklóssy-Kubinyi chateau in Erdőtarcsa is ideally situated for rest and relaxation in a beautiful environment just 50 km from Budapest. Having wireless internet connectivity the castle hotel of the Hungarian Academy of Sciences enabled the enhancement HUNAGI blogs from this remote place. ANNOUNCEMENT: The Republic of Croatia joins EuroSDRAt its 110th meetings in Rotterdam, EuroSDR was delighted to admit the Croatian Geodetic Institute (CGI), based in Zagreb, as the eighteenth member of the organisation.CGI, together with the State Geodetic Administration of Republic of Croatia (SGA), will be represented by Dr. Zeljko Hecimovic (CGI) and Mr. Ivan Landek (SGA). ANNOUNCEMENT: European Digital Airborne Camera Certification – EuroDAC²EuroSDR has recently commenced an initiative in digital airborne camera certification. The initiative may be seen as a consequence of our previous empirical analyses of system quality. It was also influenced by the ongoing activities of the USGS quality assurance plan. 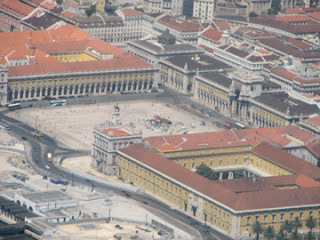 A clear need has been identified for an agreed European Digital Airborne Camera Certification process.The project, to be known as EuroDAC², was officially accepted in May 2007 and a Position Paper has been distributed within the European national mapping authorities and institutions. 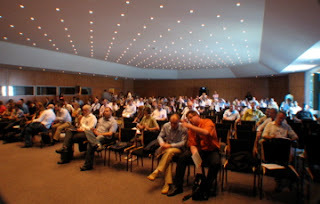 The purpose of the position paper is mainly to inform key people of this new EuroSDR activity and to ask them for their individual requirements on future digital camera certifications.For further details, please contact Michael Cramer, Institut für Photogrammetrie (ifp),Universität Stuttgart. ANNOUNCEMENT: EuroSDR begins a project on the Radiometric Calibration of ALS IntensityThe objective of the project is to develop feasible, cost-effective techniques for national mapping and cadastral agencies (NMCAs) and value-adding companies to carry out intensity or backscatter cross-section calibration and to evaluate the proposed approach together with the NMCAs and companies.A team from the Finnish Geodetic Institute (FGI), Helsinki University of Technology and Vienna University of Technology (TU Wien) will lead the project.Between now and early 2008, FGI and TU Wien will develop the methods to be explored during the EuroSDR project by studying different approaches for intensity and cross section calibration. They will employ different airborne laser scanner data to verify calibration equations. They will then issue a request to companies and national mapping agencies to collect data to be used by project participants to evaluate intensity calibration methods. 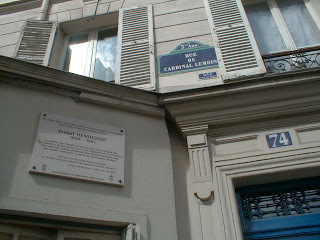 The project is scheduled for completion during 2009. A call for proposals towards the realisation of the test-bed was issued and the call deadline is now passed. A panel made up of representatives from AGILE, EuroSDR and OGC is now reviewing and evaluating the responses to this call. Further calls will be made for participation in subsequent stages of test-bed development. 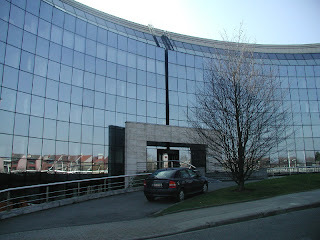 EuroSDR is a pan-European organisation established, as OEEPE, in 1953 in Paris, in accordance with a recommendation passed by the Council of the Organisation for European Economic Co-operation. Eighteen countries comprise the current membership of EuroSDR. Delegates from national mapping organisations, research institutes and the private sector from the member countries devise together a rolling research plan every three years. The plan aims to address the research needs of core spatial data provision, management and delivery. It is realised through timely applied international collaborative research projects, focussed workshops and specialist taskforces. Research results are reported widely through technical papers and a high quality ‘Official Publications’ series. Knowledge gained is further transferred to the user community through the EuroSDR education service based on short concentrated distance e-learning courses. Suitable GI organisations from European countries (members of the Council of Europe) may become Members of EuroSDR. Applications for membership should be addressed to the Secretariat. by the courtesyof the Hungarian Space Research Office at the Ministry of Environment and Water, HUNAGI received an excellent overview on the role of FGDC services and activities yesterday. - FGDC's role to support GSDI Secretariat in Reston, Va.
Mr.José Simeón Rodríguez Sánchez, President of the Brussels based European Land Registry Association AISBL known as ELRA contacted the SG of HUNAGI during the 13th European Commission GI&GIS Workshop held in Porto between 4-6 July 2007 in order to build links with the Department of Land Management and Geoinformation of MoARD, the national authority responsible for the land and real property registry in Hungary. The Head of the DLAG/MoARD was informed on the inquiry on 9th July and now there is a green light to fill the gap. 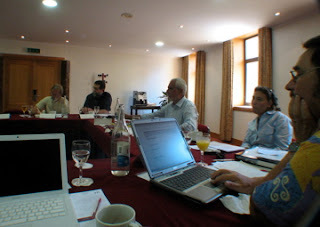 The presentation was given by the Hungarian member of the EUROGI ExCom on 7th July. The presentation was extended by Bruce McCormack, Joao Geirinhas. Representative and President of IRLOGI, Bruce McCormack was voted unanimously for Vice-President of EUROGI in Porto at the ExCom Meeting of EUROGI. 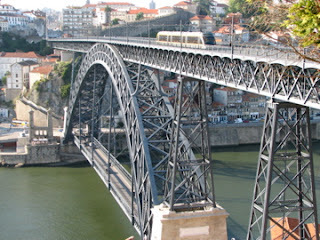 INPSIRE and the Environment is the subject of the 13th GI/GIS Workshop of the European Commission held in Porto between 4-6 July. FÖMI INSPIRE WG Chair Pál Lévai of FÖMI and the SG of HUNAGI participate the event.